I’ve briefly discussed the website Roll20 on here in the past, but I’ve never looked at the system for running or playing on a campaign. Recently, I have been getting involved in a Numenera campaign with some friends. Whilst I won’t be showing anything that’s happening from that campaign, I will show you what Roll20 does and how you can make the most out of the amazing tabletop platform. Roll20 was designed to allow people across the world to have a virtual tabletop. Unlike Tabletop Simulator, Roll20 aims to provide an easy way to integrate your camera and microphone, as well as an environment fit for running an RPG campaign. 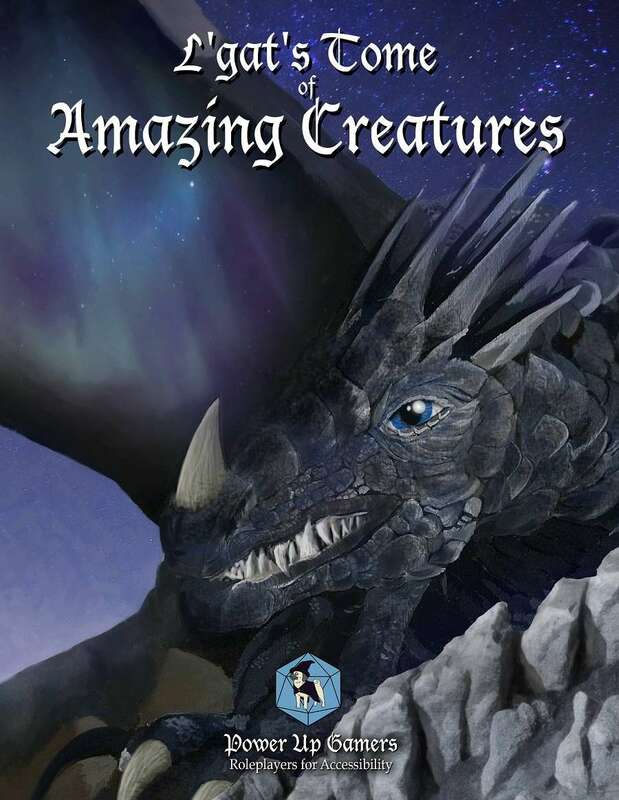 It’s used by tens of thousands of people and the community is really buzzing, full of wonderful campaigns and rooms ready for people to jump right into. 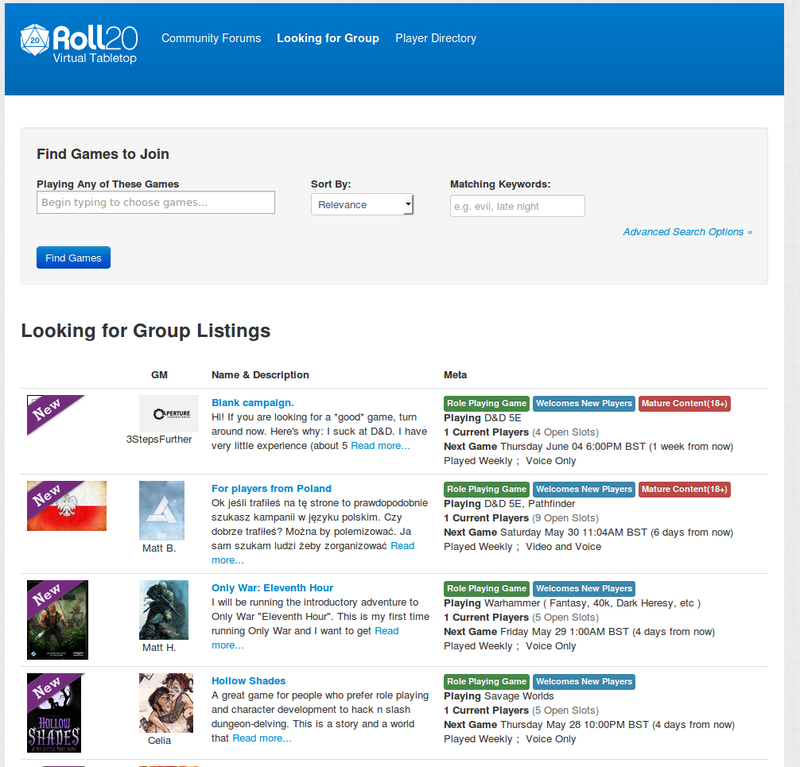 To play a game in Roll20, you have two main options: Form a group with your friends, as you would in real life and have one of them be the DM, or use the Looking For Group system. This matchmaking system simply allows you to find and select a game to go and join. Of course, DMs can decide not to put their game on the LFG system, so it’s not like you’ll always be running a campaign and some random person shows up! Okay, but what about for the DMs and the players? Thankfully, whenever you need to do a roll, you can do this within the Roll20 Campaign itself, by simply going to the chatbox and typing in /r d20. That will roll one 20-sided dice, which is useful to know, but as you can imagine, just rolling one 20-sided dice alone isn’t particularly useful. Instead, you can do combinations of things such as /r 5d6 to roll five 6-sided dice. It’s an intuitive system and you can have 3D dice appear on your screen to accommodate it, should you want so see something physically rolling. You can also make macros of your spells and abilities. For example, if I said I wanted to use Firebolt, which was 2d8 with a 50% chance of burning, I could have it so my character says out loud: Firebolt! Rolls 2d8 and immediately after rolls a d2. This speeds up the flow of gameplay, allowing you all to focus more on the story. In the world itself, you can build up your campaigns by managing the three layers: Tokens, Maps and Tiles, Portraits and there’s also an Everything option. This allows you to search the internet for specific things. 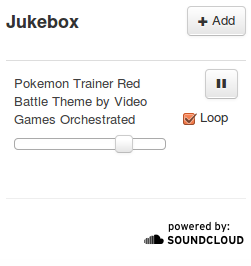 For example, in the campaign I’ve been building as an example, you’ll see Pikachu and Dugtrio standing on Kanto. 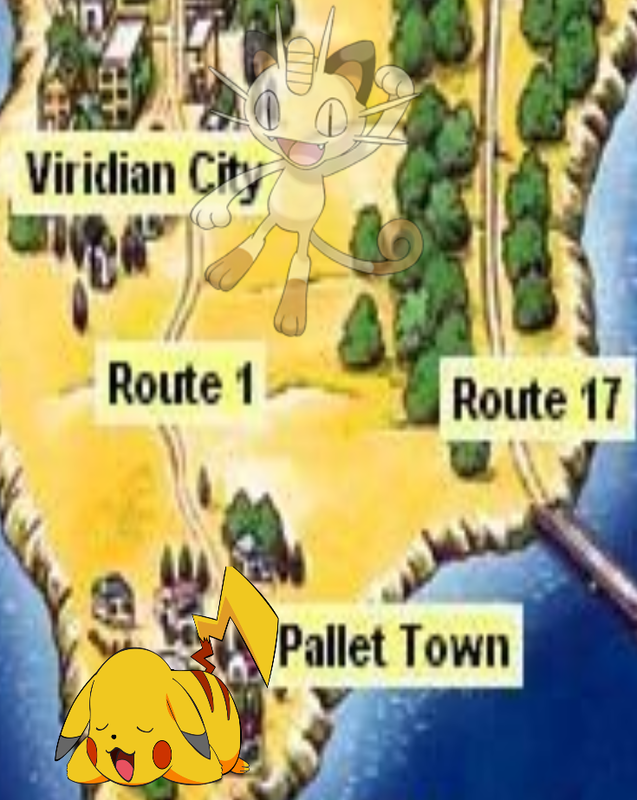 The Kanto map was put into the Maps and Tiles slot, whereas the Pikachu and Dugtrio are on the Tokens layer. It’s very possible for DMs to set up the whole game before it becomes available. Do you see the Meowth just above Pikachu, who is somewhat transparent? He’s like that because he’s on the DM layer, a way for a DM to set up a game before his party comes to play. When that Pesky Pikachu comes just close enough, Meowth will emerge from the shadows and start off a Pokemon battle… I mean RPG battle. Okay, so I’ve given you a rather cheesy look through the Roll20 system. 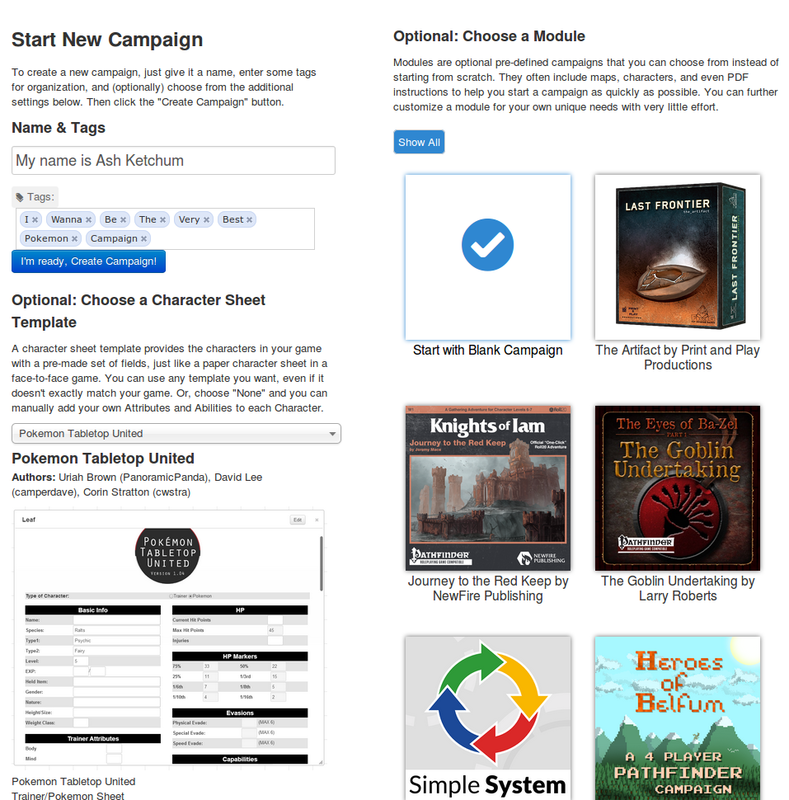 You can add music, you can add materials and now thanks to the way they’ve continuously developed the system, you can choose from the start a template for your campaign. This means you can build a game off another game, or you can just use the free template character sheets. You select all of these extra options back when you’re making the campaign. 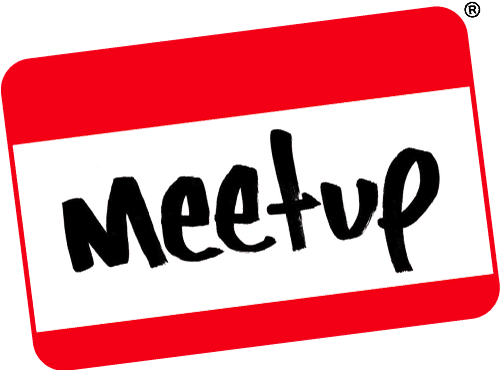 To see more with Roll20 please do go and check it out for yourself – It’s free to use, but you get more features such as the powerful scripting API, if you become a mentor or a backer at some level. it seems that since I last wrote about Roll20, there have been numerous things added in (Such as the built in character sheets, for one!) It’s apparent to me there is a great community behind Roll20 so please check out the wiki for more information on using it. Do you use this service? What do you think about doing a tabletop RPG over the internet? As always, please put your comments below, over on Facebook or Twitter and let us know what you think of this awesome web platform. Do you like tabletop gaming? Do you like tabletop gaming with tiles as a visual way to represent your worlds? Then look no further, welcome back to Kickstarter Highlight. Those of you who have been reading this website for a while will be aware of one of our longest standing series of 2014, the Kickstarter Highlight series. It was during the duration of the highlight posts that we found out about Julian G Hicks, a guy who was producing some sci-fi storage containers for his soon to be launched Tabletop Towns tiles. He’s back once more with Phase One of his Sci-Fi Tiles Kickstarter Campaign, which you can check out here. This time, he was after just £950 which he has already passed at nearly £1250 as of the time of writing. These are simply double-sided 3″ square plasti-card floor plan tiles. That might sound like a lot of gobbledegook at first, but basically these are 3″ by 3″ square tiles which are used as floor plans for your tabletop RPG campaigns and skirmishes. Being double sided and with all of the different tiles and products within the Tabletop Towns repertoire, you can truly begin to imagine this is going to become a large range of products for Tabletop Towns. Heck, what if you just wanted to design your own game and wanted a visual way to design it? These would give great visual feedback for the novice game designer, so it’s worth noting how these could have more uses than first meets the eye. What do they need funding for? Well the £950 the creators were requesting were to guarantee the first production-ready print run of these tile sets. The money will also be going towards paying for the art that is on the tiles. It’s a really small ask for some really beautifully presented tabletop campaign tiles. Hopefully this gives you a small idea as to the sorts of products the Tabletop Towns Kickstarter Campaigns will be delivering in future. Have you ever used tiles for your tabletop campaigns? Have you pledged towards these campaigns in the past? As always, please leave your comments below, or over on Twitter or Facebook and we’ll see you all next time for another creative Kickstarter Highlight!